As regular readers may have gleaned, a long term project of mine is an elizabethan project. Obviously 'Elizabethan' is an a very Anglo-centric name for a period of history and the particular conflict that always interested me was the Dutch revolt against Spain. 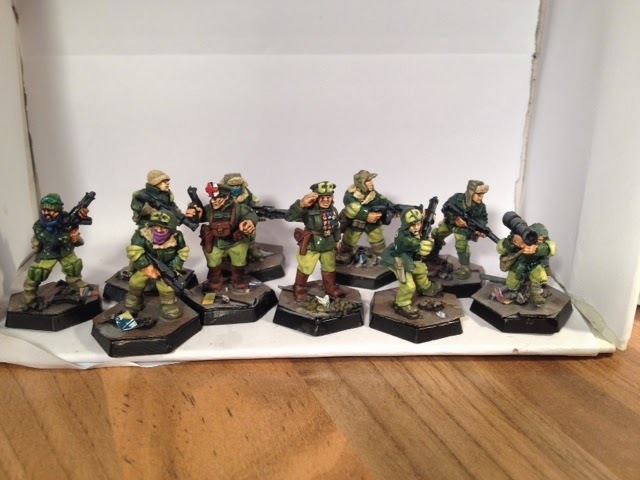 I bought loads of figures and have started to paint them all but something that has always stymied the project is rules and the scale I wanted to play. By scale I don't mean the size of the figures (28mm is gods scale why try anything else) but the size of the battles. 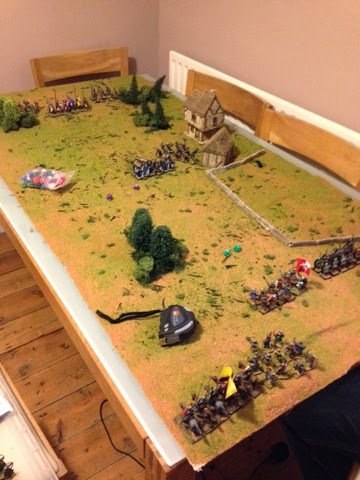 Although there were some set piece battles during the revolt (also known as the 80 years war) a lot of the interesting combat were actually of a much smaller size. A lot of the war in the Low countries revolved around sieges of the fortified towns so actual combat tended to be smaller 'actions', ambushes, skirmishes, pursuits all involving a couple of companies of troops. When I started to read about the 'Donnybrook' rules I decided they fitted exactly what I wanted. They even fitted the size of the 'companies' I was organising and painting. 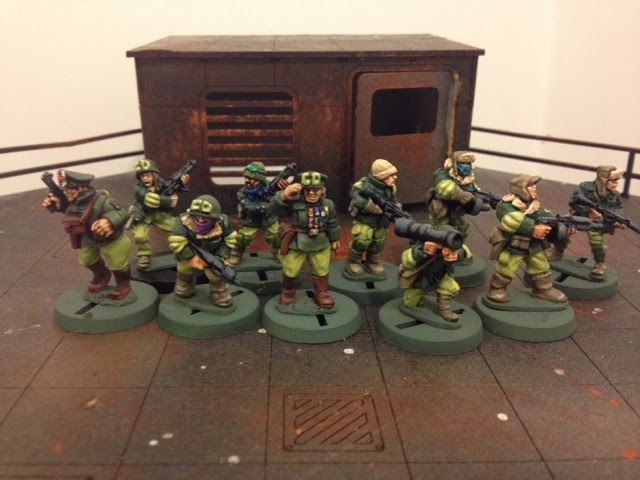 But, as you all know, painting figures takes time and I wasn't going to have anything to play with for some time as the was essentially a second rank project, for me and done when I had time. In an idle moment before the arrival if mini whiskey no.4, I decided to use the random inquisitor rules to roll up a Warband for a figure I bought at the hitchin table top sale. 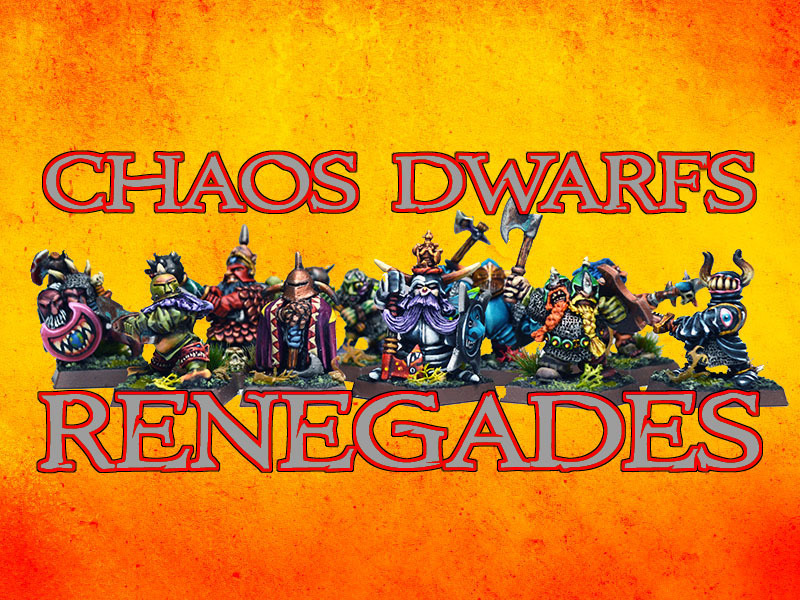 I figured if the OGRE group started playing RT games then it'd be a good excuse to paint up a new Warband as well as more classic figures. 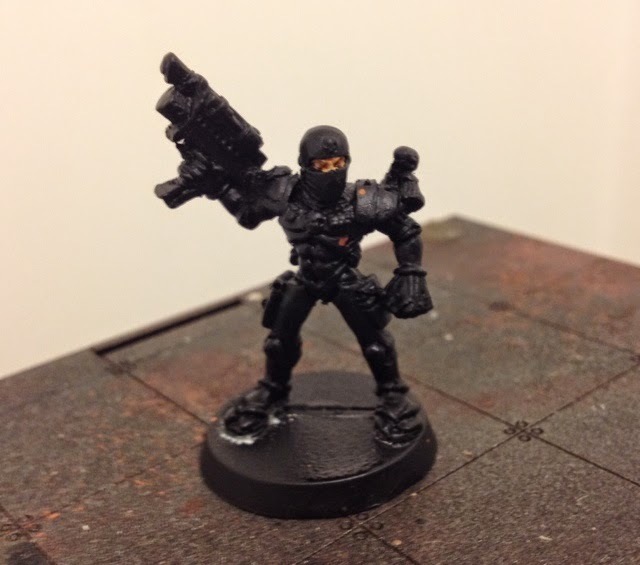 The Jes Goodwin classic Rogue Trader assassin is a must! 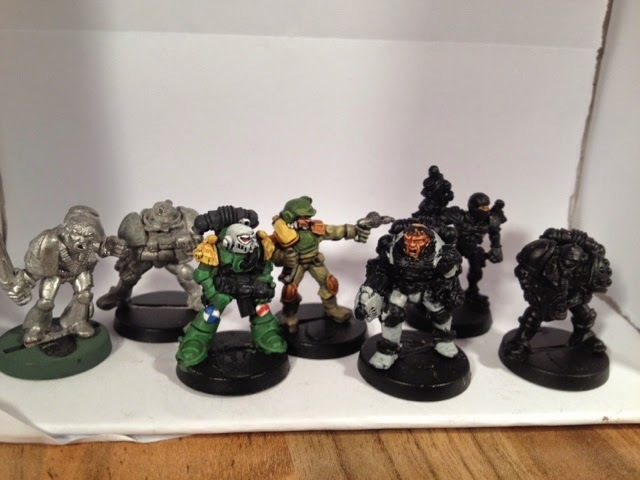 I figured this was the perfect opportunity to do some mercenary marine types and started looking for some figures and managed to get a hold of 3 of the 'armour variant' figures and a particularly mean looking 'Christmas marine'. 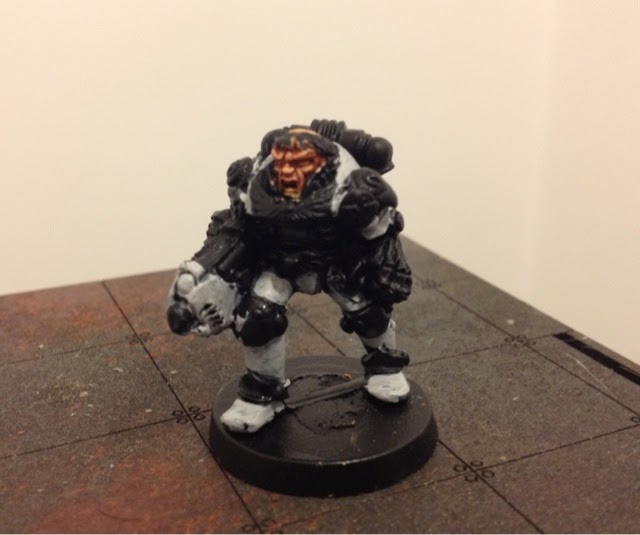 They all look the part, power armoured psychos willing to do an inquisitors bidding for the right price. More to follow as I get them painted. Just a quick pic to show the citi-def all based up. I went for hex bases in a nod back to oldschool. 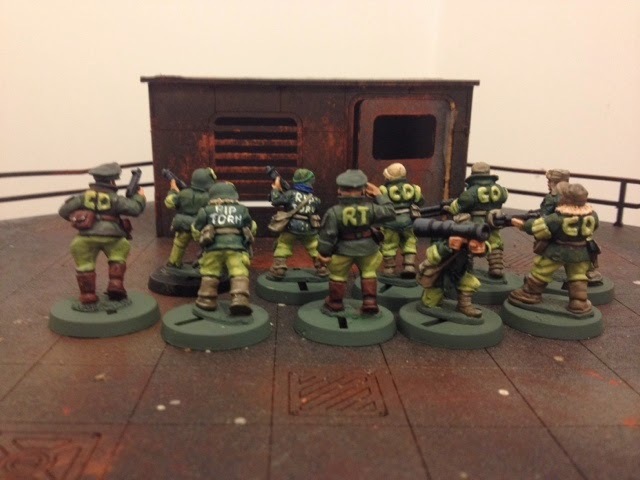 Still to have a game with these guys but I've got enough figures sitting around to do a couple of street gangs (bikers and street punks) and cursed earth savages using copplestone scavengers, necromunda scavvies and GorkaMorka diggas. Once I get a first game in then I'll see who's next! I've been a bit quiet lately and long term followers will know that my wife and I have been waiting for a special delivery, and not from ebay this time. 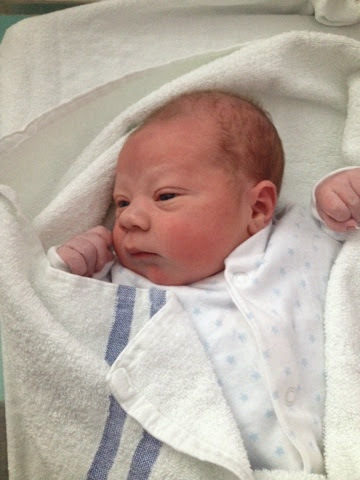 Well the wee man arrived this morning, 5 days late. Once he'd decided he was coming though there was no stopping him. Hamish arrived only a couple of hours after getting into the maternity ward and Mum and Baby are already home being looked after by my parents who made the journey down from the homeland to help out. My dad, being a traditionalist, has brought a bottle to wet the babies head. 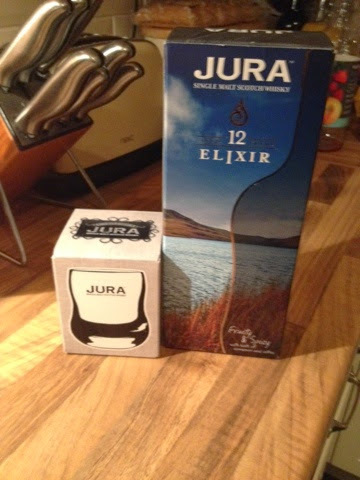 I'm off to have a wee nip or two. Last night I played host to Snicket and we played a game of the new osprey medieval rules, Lion Rampant. Having managed to sort out some units of figures for us to choose from we went for the recommended 24 point retinues and ended up choosing identical sets consisting of a unit of mounted men at arms (containing our leaders), a unit of expert foot serjeants (halberds), a unit of normal foot serjeants (spear), a unit of crossbow and a unit of archers. The men at arms are six figures strong and all the rest are all 12 figures. 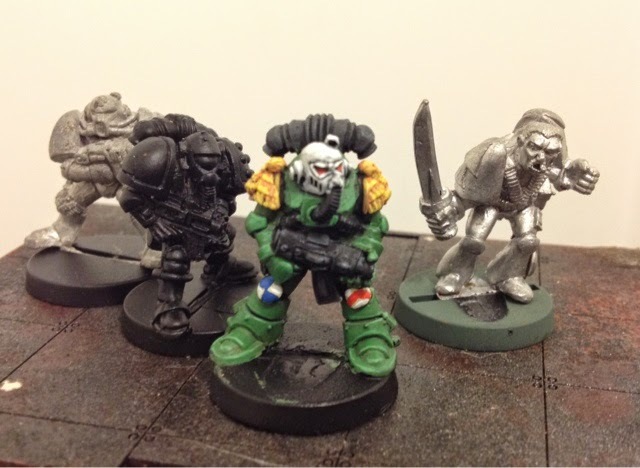 Unlike warhammer there is no need to rank them up (which we kept doing out of habit!) unless they are using a formation like schiltron that serjeants can use. The units can move in blobs with figures all with 3" of a central figure. We rolled for a scenario from the book and got 'Defending the Indefensible'. One retinue were defending and object (in this case a siege cannon) placed in the middle of the table and the other retinue were trying to smash it. All the attackers had to do was get a single figure in contact with the cannon and they win. We rolled for attacker/defender and Snicket got to attack while I got to place up to 10 points of my force around the cannon and the rest at the table edge. Snicket set his retinue up at the opposite table edge. 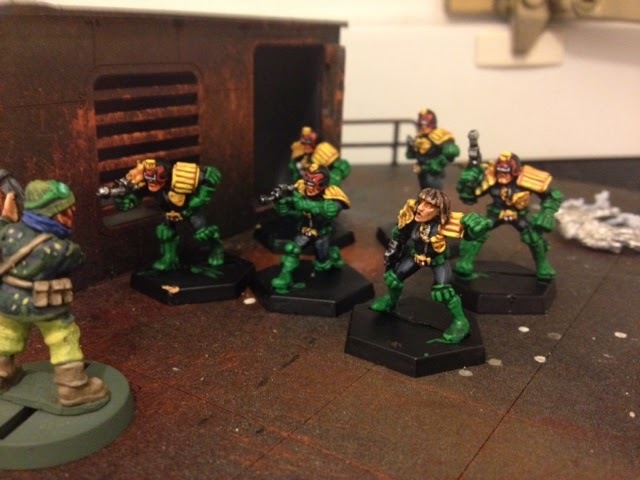 Apart from basing I've managed to finish up my citi-def unit for Judge Dredd, another game that wants to be played. Although some of the mongoose figures are nice (I really like the apes!) I couldn't justify spending loads of cash on a whole load of new figs that I wasn't entirely convinced by and that I also had a perfectly good set of figures for. 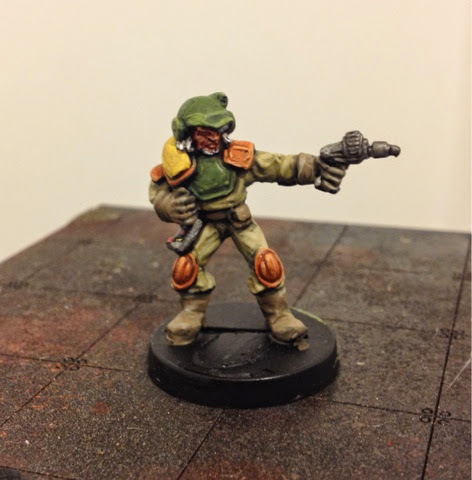 The citi-def are all from the copplestone castings future wars range, mostly neo-soviets with some scavengers. 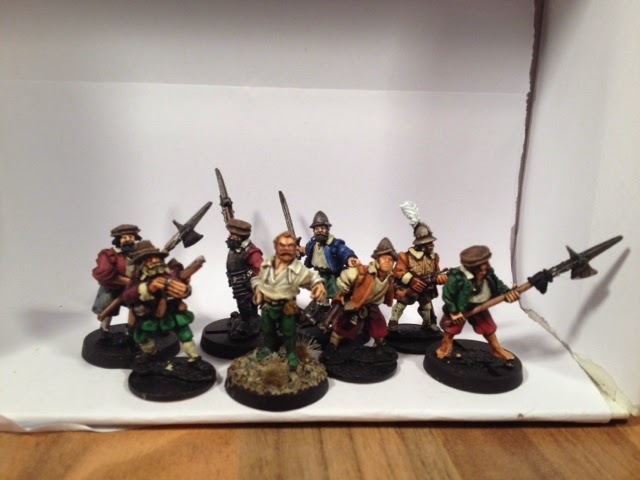 I've had these figures for ages and I'm really chuffed to finally get them painted. I did a bit of green stuffing for the lettering and some elbow and knee pads for that 2000ad look. If these rabid gun nuts get a bit carried away and decide to start a block war the judges will be round sharpish to sort the out. As you can see the boys are from Rip Torn Block. The scummers from Angela Lansbury Block better watch out! Hopefully I'll be having a game next week. So keep your eyes peeled! In my opinion, this is one of the most influential books that were published during the reign of Rogue Trader. I reckon it may be as widely read as the rulebook itself if not more. 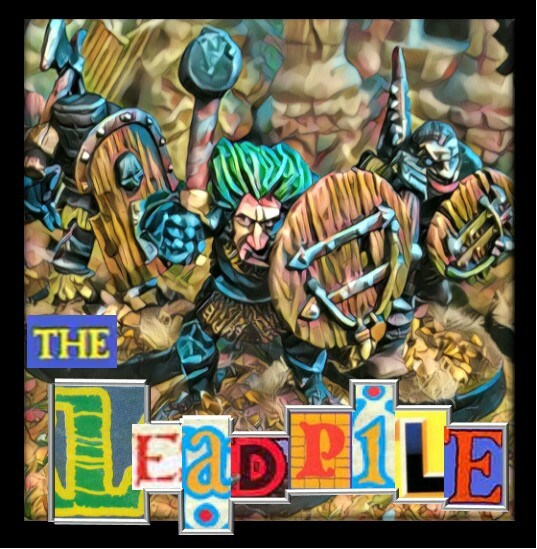 I've seen it more in more people's collections than any of the other Rogue Trader era books (Compilation, the three Ork books, Siege, The two ROC books, Astronomican and Vehicle Manual) and looking at it today it has done more to shape the way 40k developed than any of the other publications. What makes this even more surprising is that it is not a coherent book like most of the others but instead, like it's sister publication, Compilation, a collection of articles form White Dwarf. I think the very act of collecting all these articles together are what makes them so influential. Would they have made such an impact if they had only ever appeared in the monthly mag? With BOYL15 having been officially launched its time to start looking at getting stuff organised. One of the games that I'm hoping to take part in has been dubbed 'warhammer ahoy!' And is essentially a big old game of fantasy 3rd ed but with ships! Yay! I'm putting together a ship from Marienburg called 'the prince of foxes'. The name comes from a film starting Tyrone Power and featuring Orsin Welles and based on a novel by Samuel Shellaberger. Set in early 16thC Italy it's the story of a Condottiere in the service of Cesare Borgia. 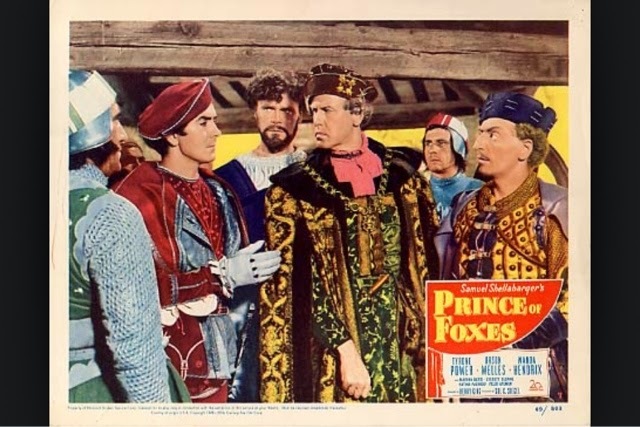 He is sent to a mountain top city (filmed in San Marino) in an attempt to bring the ageing duke to the Borgia side. The Condottiere falls for the dukes young wife and when his background as a commoner masquerading as a member of the Orsini family comes out he is betrayed by some of Borgias other men but escapes and returns to fight in the defense of the citadel.